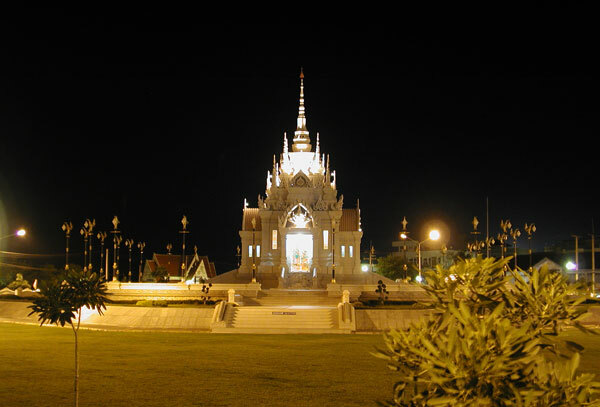 THAILAND, "The Land of Smiles"
is basically the melting pot of Southeast Asia, combining Buddhist temples, remote villages, ideallic island beaches, modern cities, a thriving trade and tourist industry, and the ubiquitous Thai people themselves. 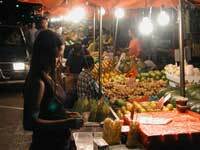 Starting with Bangkok and the infamous Khao San Road, you get a sense of the dichotomy of Thai culture, where East meets west and age old traditions share the smog choked air with the latest commercial trends of America and Europe. Khao San is the hub of SE Asian travel, where you can arrange getaways to trek the mountains of Nepal, see the ruins of Angkor, navigate the Mekong from Laos to Vietnam, and of course, grab a beer and a 10 baht plate of pad thai. Almost all journeys in SE Asia start here, as Bangkok is one of the cheapest and busiest airports in all of Asia. If you forgot to pack something for your trip, odds are you can find it in Bangkok, and it will be cheaper than is was back home anyway. 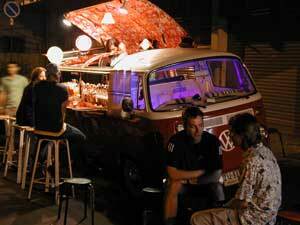 VW microbus turned streetside watering hole. Travel in Thailand is both easy and affordable. A well connected network of trains, buses, ferries and longtail water taxis can get you anywhere you want to go, usually within a day, and if you are willing to spend a little more, you can fly between most major cities in the country for around US$60 one way. Not bad for the economically challenged traveler. This last year, the Thai baht (national currency) was hovering around 40B=US$1, with the average meal costing 30B, beers about 40B/per, and beach bungalows b/t 200-500B/night. It's pretty easy to see why Thailand is one of the hottest tourist and backpacker destinations in the world. 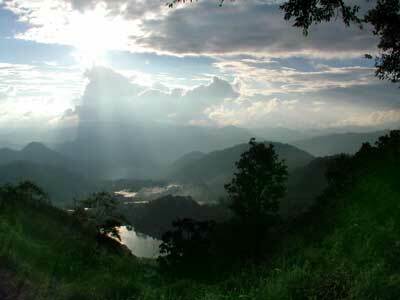 For the single traveler, it is also a relatively safe country to travel in. Unless you make an effort to get off the "beaten path", you will most likely always find yourself surrounded by backpackers from around the world doing the same thing you are, searching for that perfect beach, the solace and serenity of a mountaintop temple, or bargain hunting in one of the thousands of open air markets in the country (every village and town has at least one). 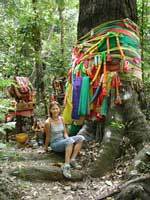 Diversions in Thailand are many and troubles are usually few and far between. Nevertheless, it's a good idea to not let your guard down too much, as thefts and scams aren't entirely absent. 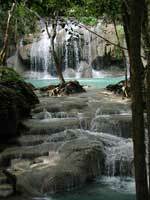 It's not too difficult to find true scenic beauty in Thailand, as the country's National Park system highlights some really amazing natural phenomena. Whether it's mystical mountain ranges, unspoiled marine sanctuaries, a remote jungle oasis or cascading waterfalls you're looking for, it's all here. Most parks charge a nominal 200B entry fee, and each park pass is good for all Nat'l Parks you visit within that same day. 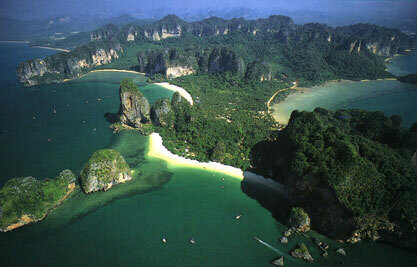 Thailand's islands and beaches are world famous, and offer great diving, snorkeling, hiking, mt. and dirt biking, etc. 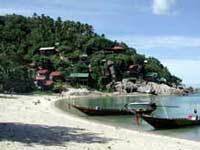 Most islands are only a short ferry ride from the coast and can be reached in an afternoon. Beach bungalows are cheap and prevalent, most with restaurants and bars right there on hand. 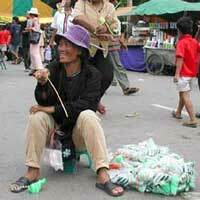 Street peddler at the Dragonboat Festival, Surat Thani. 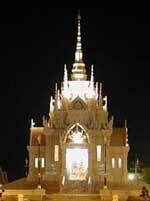 Above: the city temple of Surat Thani. 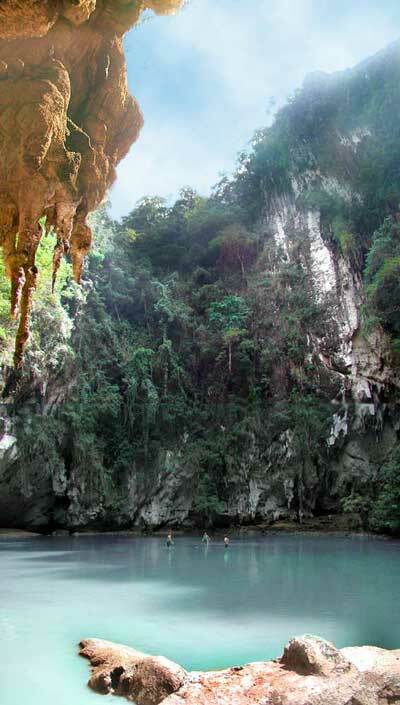 Right: the peninsula of Railay, in the Krabi province. Above: The night market on the waterfront in Surat Thani. Right: Kelly in front of a prayer tree on the island of Ko Phan Ngan. 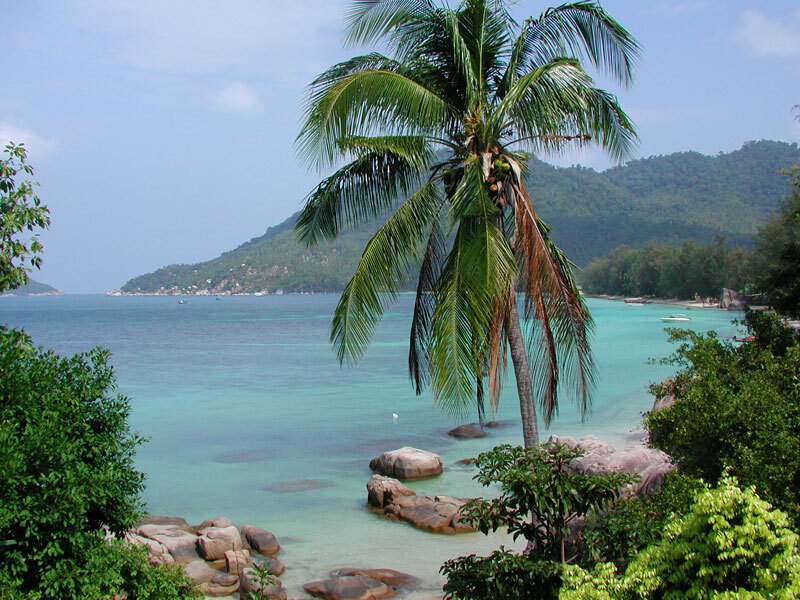 Below: the east coast of Ko Tao. Hat Sadet beach on the west coast of Ko Phan Ngan, in the Gulf of T'land.